Vacay.ca occasionally publishes articles on destinations outside of Canada. As our readers begin to plan their winter escapes to warmer climates, our experts are reporting from sun destinations. In this article, Vacay.ca Contributor Tyler Summers writes about his recent trip to the popular Mayan Riviera in Mexico. 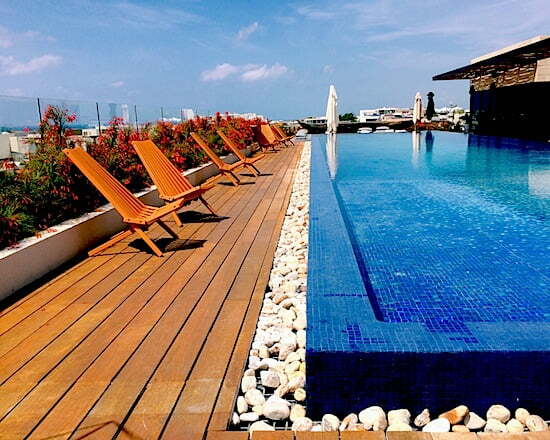 PLAYA DEL CARMEN, MEXICO — Tired of the typical, all-inclusive “getaway” to a mega-hotel in Mexico? It’s the kind of trip where the package deal looks good on paper but once you realize you’ve sold your soul to the cheapest devil in town you can’t leave the compound without getting verbally assaulted by a gang of timeshare sharks coaxing you to watch a three-hour presentation to get a free sombrero. You wouldn’t be the only traveller who is fed up with the thinly veiled “tag ’em and trap ’em” formula. I was glad to discover that Hotel Cacao in Playa del Carmen is a different animal all together. A sophisticated, sleek property providing a boutique hotel experience you will savour. Think unfettered entrance and exit to an ultra-modern open-concept lobby with genuinely helpful and attentive staff, beautifully hand-crafted cocktails, locally sourced food offered 24/7. Hotel Cacao delivers on the promise of providing a true boutique experience in both form and function. The architecture is a contemporary mix of stone, bamboo and glass with everything from furniture, light fixture and fabrics all sourced from within Mexico. 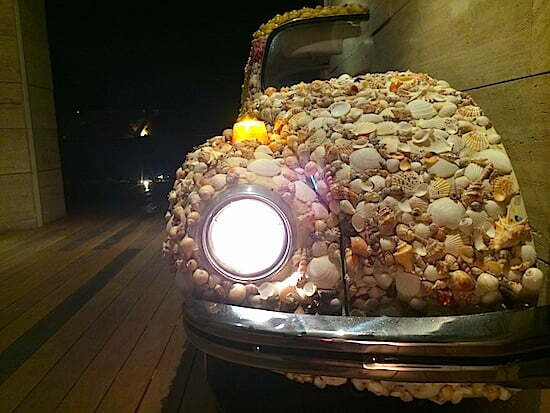 One of the first things you see upon entering is a halved Tommy Hilfiger-designed VW Beetle on display in the entrance to the restaurant; the other half sits at the entrance to the rooftop bar. If you want to splurge go for the Junior Suite, which has enough room to comfortably play Twister while surveying the Missoni-branded soaps and body creams. Meanwhile, the Master Suite can host an entire Twister tournament and has room enough to accommodate onlookers in the terrace Jacuzzi. The rooftop bar provides a luxurious atmosphere with a mixology cocktail experience miles above and beyond the typical all-inclusive margarita-tequila mayhem. Try the Cacao Maya, a tequila, licorice and chocolate cocktail concoction that is a meal in itself, or the Villa, which blends mescal, tamarind tea, cucumber and ancho chili. After just one sip you’ll be reminded that you are alive and living la vida loca. The scene at the bar is all soothing live mariachi music, locals and visitors mingling amongst the chic designer day beds, cabanas and funky hanging wicker chairs with ocean waves gently crashing off in the distance. During the day you will not be forced into wacky group games with pumping dance music with a social coordinator yelling over the PA, “Let’s get this party started!” Rather, you may choose to take some time for a yoga session in the air-conditioned gym or catch up on that book you’ve been meaning to finish while you recline beside the inviting infinity pool with a refreshing glass of tropical fruit juice within reach. Pure bliss. The crown jewel of Hotel Cacao is the restaurant, Nibs. Chef Alejandro Cuatepotzo was recently recognized as a “Rising Star of Mexico” at the 2015 Wine and Food Festival Cancun-Riviera Maya. It makes sense then that the design of the hotel cradles Nibs at its centre. The open-concept space has massive canvas tenting stretched above the dining area and a verdant jungle mural accenting a feature wall. Mornings feel fresh with splashes of colour and light cascading across the turtle pond and modern-looking zen waterfall. Come sunset, the place transforms into a romantic dining experience with live music set to candlelight. Try the ceviches with coconut and lime, lobster with green mango salsa, shrimp burritos or the mouthwatering conch fritters. All the dishes are artfully crafted with local ingredients. What truly galvanizes Hotel Cacao as the clear choice for your next sun vacation is its location, smack dab in the heart of Playa del Carmen on the city’s famous 5th Avenue. Ah Cacao Chocolate Café, which arguably serves the best iced café mocha on the planet, is down the street. 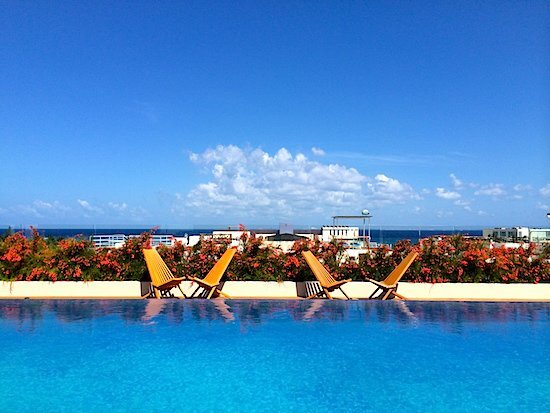 Nearby is renowned restaurant Almirante Pech, where lunch on the patio makes for entertaining people watching. Mamitas Beach Club turns into a party at night and is a great place to charge up for the short walk back to the hotel. Checking into the 60-room Hotel Cacao is like staying at your uber-cool cousin’s house. Kind of like family, the Cacao staff is warm and welcoming but also savvy enough to point you in the right direction should you feel like fully exploring your destination. This is the kind of hotel where you’ll actually feel like you took a vacation, the kind that replenishes your mind, body and soul. Now, can an all-inclusive do that? I don’t think so either. Room Rates: Nightly rates vary according to season, but expect to pay between $200-$500 per night, which includes continental breakfast.